The Kanger Uboat Replacement Cartridge is a compact and lightweight tank designed specifically for use with the Kanger Uboat Starter Kit. Together with the mod, this device forms the shape of a submarine for stealth and ultra portable purposes. These cartridges have dimensions of 22mm x 15mm x 38mm with a large 2mL e-liquid capacity. To fill the reservoir, pour your favorite e-juice into a small hole covered by a leak-proof Silicone plug. Aside from this convenient reservoir is a 1.5 ohm Ceramic coil designed for a fixed low wattage to provide a consistent and luxurious vaping experience. To vape with the Kanger Uboat Replacement Cartridge, make sure the device is charged and on, then simply take a draw. This draw-activated method is a classic and terrific way to conserve battery life and vape on-the-go anywhere, anytime. 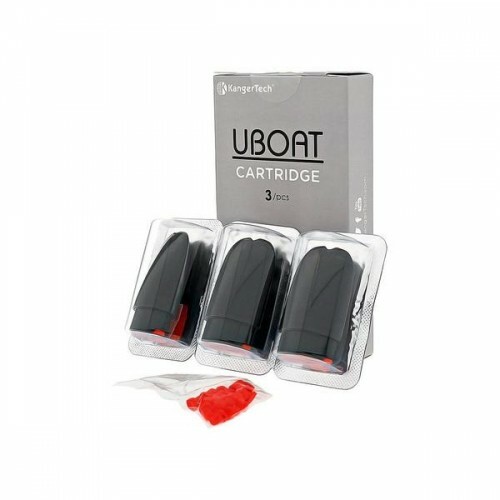 If the exquisite Kanger Uboat Starter Kit has become your go to kit, then be sure to pick up a few of these refillable Kanger Uboat Replacement Cartridges.